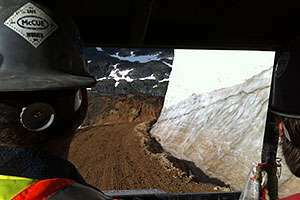 We worked on a remote mining project located in northwestern British Columbia. 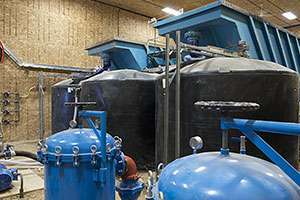 We designed, built and currently operate a water treatment plant capable of treating water pumped out of the mine shaft at rates up to 800 gallons per minute before being discharged to the receiving environment. Inlet water turbidity has ranged from below 100 NTU to over 30,000 NTU. The plant consists of two parallel modules, each with a chemical injection system to enhance the removal of total metals and suspended solids. Mine water pumped to the plant is flocculated in-line, clarified and then filtered before being discharged to the environment. The water treatment plant was specifically designed to meet the unique needs and constraints of the mine operation, including those related to the remote location of the site. 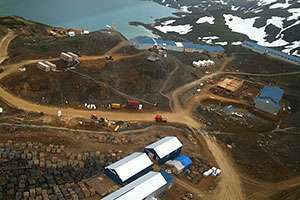 When we constructed the plant the mine was only accessible by helicopter and ice road and McCue worked with suppliers, the mine owner, the mine operator, and the transport company to tailor the system design so it could be shipped to the mine. Prior to commissioning the system, a month-long bench testing program to identify a suitable flocculant was completed. A properly developed chemical program ensures unnecessary chemical costs from overdosing to achieve results, downtime because of poor performance and risk from polluting the environment. The WTP is operated 24 hours a day, 7 days a week, year round and is reducing total suspended solids and turbidity by up to 99% and total metals by up to 90% while consuming approximately half of the amount of flocculant estimated based on the bench testing program. The WTP supplies a source of consistent, clean water for mine machinery. This project was featured in Canadian Mining Magazine.